Amrita Self Reliance Education and Employment (SREE) SHGs help unem-ployed and economically vulnerable women become self-reliant through the development of their technical and vocational skills. The objective: every SHG participant will be adequately prepared to engage in an income-generating activity or start their own business individually or with members from within their SHG. Since the inaugural announcement less than one year ago, 3,000 Amrita SHGs have already formed, surpassing the original target of 2,000 groups within the first year. 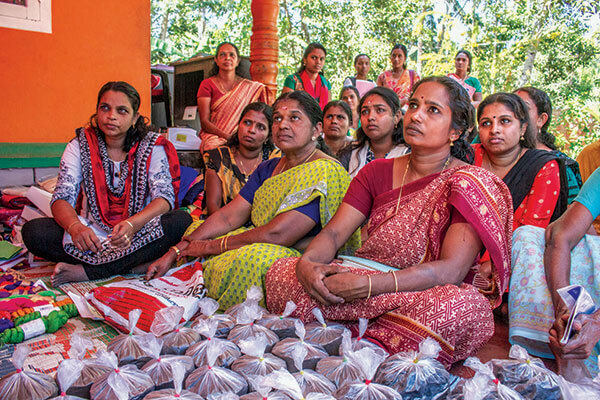 The ulti-mate goal is to establish 30,000 SHGs comprising at least 10 women each. While Amrita SHGs operate autonomously, they are nurtured by the MAM as they transition from an SHG to an Activity Group. Currently active in the states of Kerala, Tamil Nadu, and Maharashtra Amrita SHGs will spread throughout India with the help of centrally located MAM branches and the grassroots support of local devotees. Amrita SHGs are based upon a formula established by the Reserve Bank of India (RBI) and National Bank for Agriculture and Rural Development (NABARD). MAM first identifies whether a particular com-munity presents the need for an SHG and whether the group might require special training in a vocation. Groups are formed accord-ing to geographic proximity, each consisting of 10 to 20 women. Men who are family members of women within the SHG are also eligible to receive training in a vocation. Each SHG registers with MAM, which facilitates the initiation of the group’s bank account, technical training, entrepreneurial schemes, as well as offers technical assistance in the marketing of Amrita SHG products. Through a collaborative effort between MAM and local banks, Amrita SHG accounts are instituted which serve to monitor and evaluate a group’s financial management capacity. Upon formation of the SHG, a bank account is opened on be-half of each group. Each group member is required to deposit a minimum of Rs. 10 each week. When a group’s bank balance reaches Rs. 1,000, the group can begin to withdraw money and commence internal lending with a minimal interest rate. It is during the first six months of the group’s account that the bank assesses the group’s lending capacity so the group may apply for venture capital loans. Additionally, any money deposited during the first six months is matched by the bank at a ratio of four to one—thereby increasing the SHG’s initial investment by 400%. Once vocational training is complete, the SHG transitions into a more autonomous, income generating Activity Group. MAM works in collaboration with the Activity Group to locate a Common Facility Center (CFC), where the group will carry out their incomegenerating activity. While MA helps provide raw materials, Activity Groups take a majority of the initiative to jump-start and sustain their respective ventures. Accordingly, the Activity Group receives total profits from products sold. MAM receives no compensation or financial return at any time for its work with either SHGs or Activity Groups. The coming together of a number of SHGs in the immediate neighbourhood leads to what is called a cluster with about 25 to 100 SHGs that have decided to pool their economic resources together and form one single unit. The objective of forming these clusters is to be independent of bank loans. If a loan is taken by an SHG or an individual member, the loan will be taken only from the cluster’s resources, and not from a bank. In this way, the interest will go to the cluster and not the bank. During monthly cluster meetings, applications for loans are discussed.